IDLC has signed an agreement with Partnership for Cleaner Textile (PaCT) program of International Finance Corporation (IFC) with an aim to develop a concise action based business development strategy and a sustainable pipeline of clients, and gaining market recognition for its work in water &energy efficiency sector. 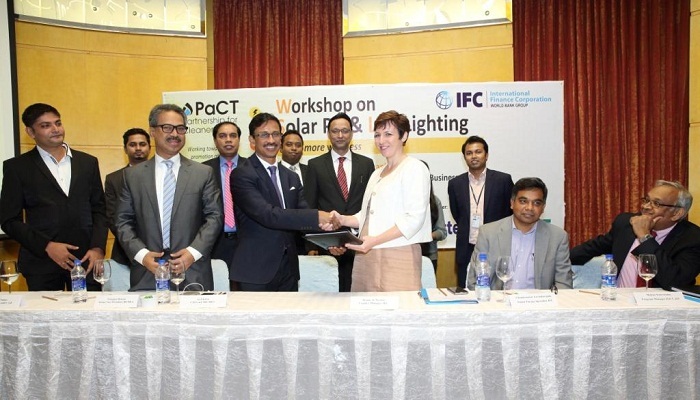 The signing ceremony was held through a workshop titled ‘Solar PV & LED Lighting’, organized by the Textile Technology Business Center (TTBC) under the PaCT program of IFC on Wednesday at Hotel Westin, Dhaka. The signing was chaired by Arif Khan, Chief Executive Officer & Managing Director, IDLC Finance Limited and Wendy Werner, IFC Bangladesh Country Manager. Md. Siddiqur RahmanPresident of the BGMEA, Faruque Hassan, Senior Vice President, BGMEA, Siddique Zobair, Member (Energy Efficiency & Conservation) of SREDAand speakers from GE, Deloitte, IDLC, SREDA, BUET and other industry experts spoke during the event. This engagement will result in developing a strategy paper on Sustainable Energy Financing (SEF), business development and building of a solid portfolio of Energy& Water Efficiency, strengthening IDLC’s position in the green industry. IDLC will provide financial solution to the PaCT partners for adopting resource efficiency technology across the industry thus enhancing its share towards sustainability.